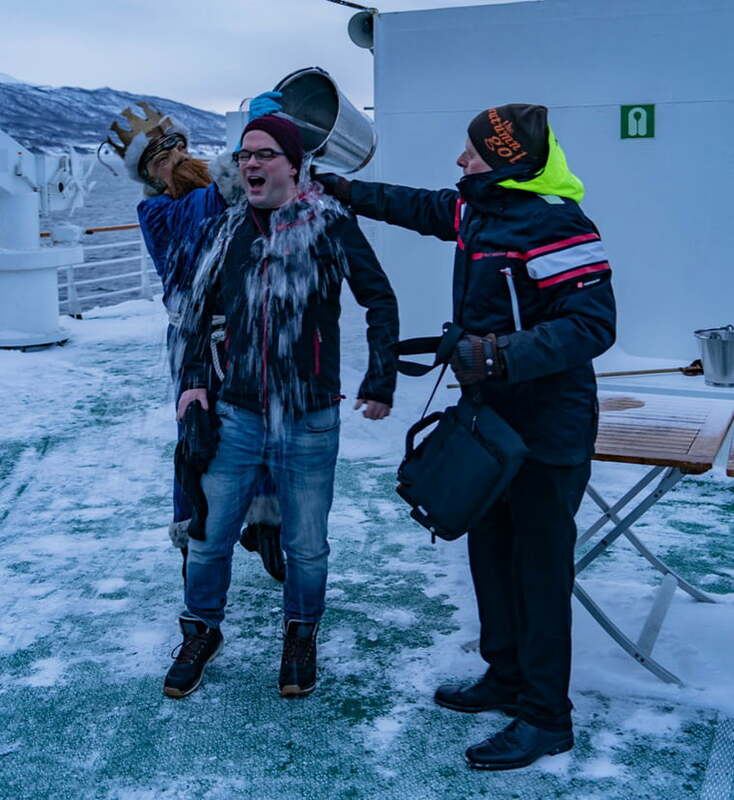 Hurtigruten Diary Day 5: An unexpectedly cold Arctic Circle ceremony (for me at least) out on deck before a visit to Tromsø, the regional capital of northern Norway. We are now well into northern Norway, and still enjoying good weather. The number staying on the ship is starting to thin a little, although the number of locals using now using the service as a local ferry is increasing. 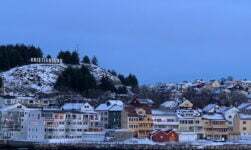 We called at three ports – Stokmarknes, Sortland, Risøyhamn – overnight so there was no opportunity to see any of these places. 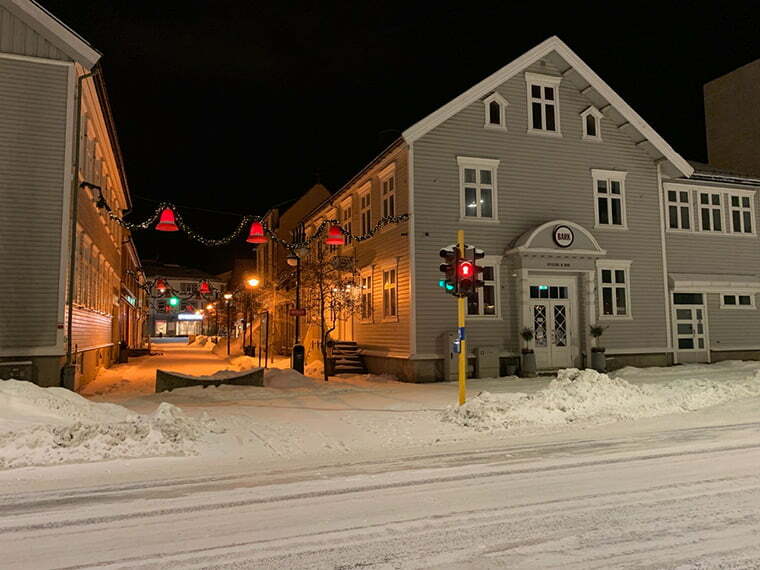 I've seen Sortland – Norway's blue town – before, but the joy of the full Hurtigruten is that in most cases, the ports we miss overnight on the way up, we see during the day on the way down. So don't worry Stokmarknes, Sortland, and Risøyhamn, I'm coming for you! After a poor night's sleep (more to do with the coffee and strong beer I drank the night before than any rolling of the ship!) 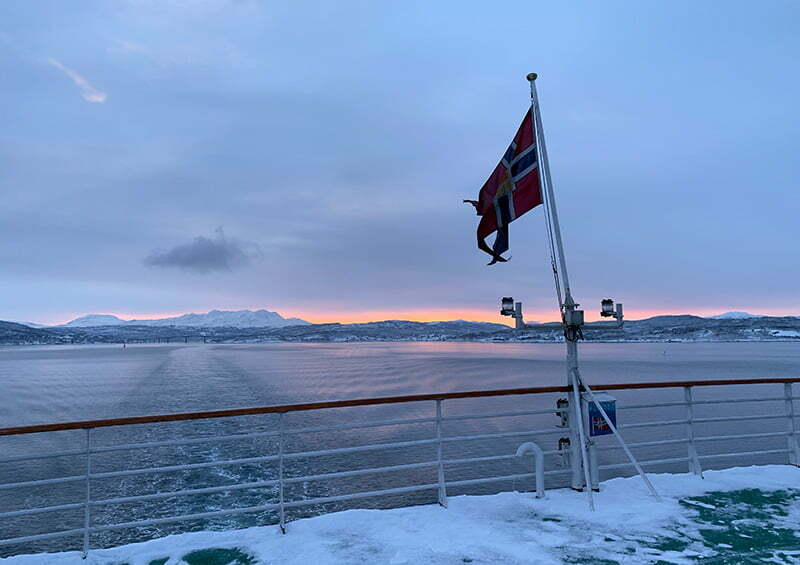 I was awake for an early port call in Harstad. So at 6.45am I left the ship on my own to take a stroll around the town. Fresh snow had fallen overnight so the town looked at its winter best. There's also nothing quite like stomping through fresh snowfall in an otherwise silent place. That sound! We crossed the Arctic Circle early on day 4, but the ceremony was delayed to today because of operational reasons and the schedule. It worked out well, because an hour outside Finnsnes the temperature dropped to around -6 with relatively low wind. Perfect winter weather once again! I must admit that beforehand I thought the ceremony would be a little tacky, but it turned out to a fun way to mark the Arctic experience. A British gentlemen I've got to know won the competition to guess at what time we would cross the Arctic Circle. Even though we had to guess to the nearest second, he was an incredible one second out from the actual time: 7.06am and 15 seconds. As I did him a favour of taking some photos of him receiving his prize, he was kind enough to let me know his secret. I shan't share it here, of course! 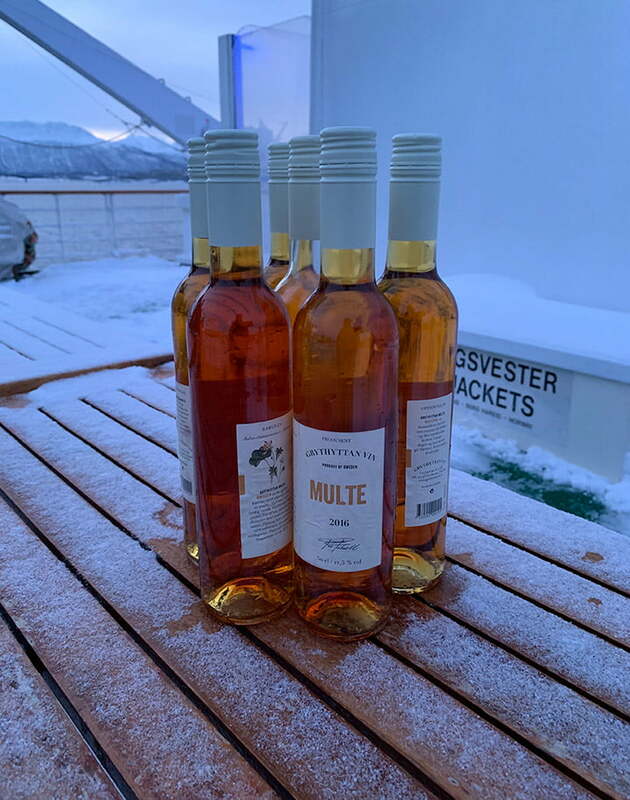 Truthfully speaking, it was nowhere near as cold as it looked, given it was -6 outside anyway, but it was an ‘interesting' experience nevertheless! A similar competition to guess the time of the crossing followed by a ceremony takes place on all the other ships in the coastal fleet. You have been warned! I had just about enough time to dry myself off and get changed before our next port of call, Finnsnes. 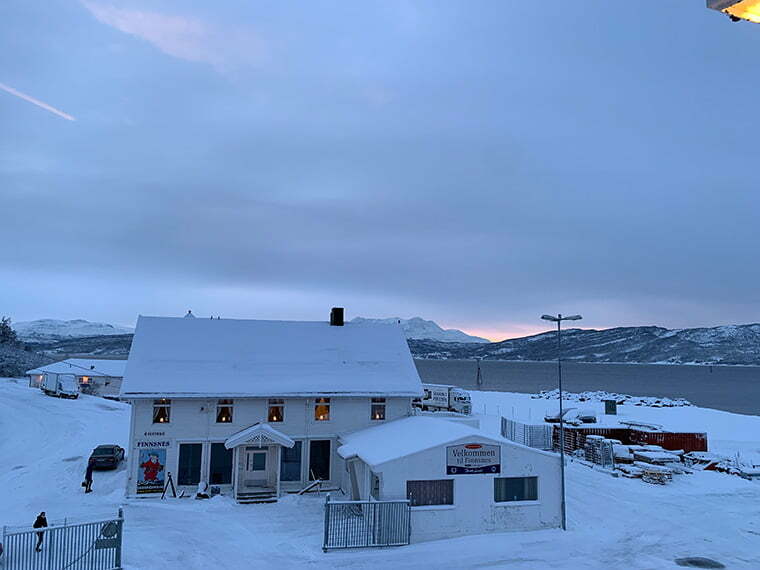 Here we were now far north enough to not see the sun rise, or more accurately to see it peek just slightly above the horizon for a couple of minutes! My accountant, who I must point out is from Finnsnes, calls it the ‘pearl of the north'. In this light at this time of year, it's hard to disagree! 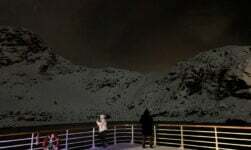 As we were in port for just 30 minutes I chose to stay on the ship and enjoy the view from Deck F.
When leaving the town, we passed under the the Gisund Bridge that connects Finnsnes to Silsand village on Senja, Norway's second biggest island and somewhere that I'm yet to spend any time. I must fix that soon. 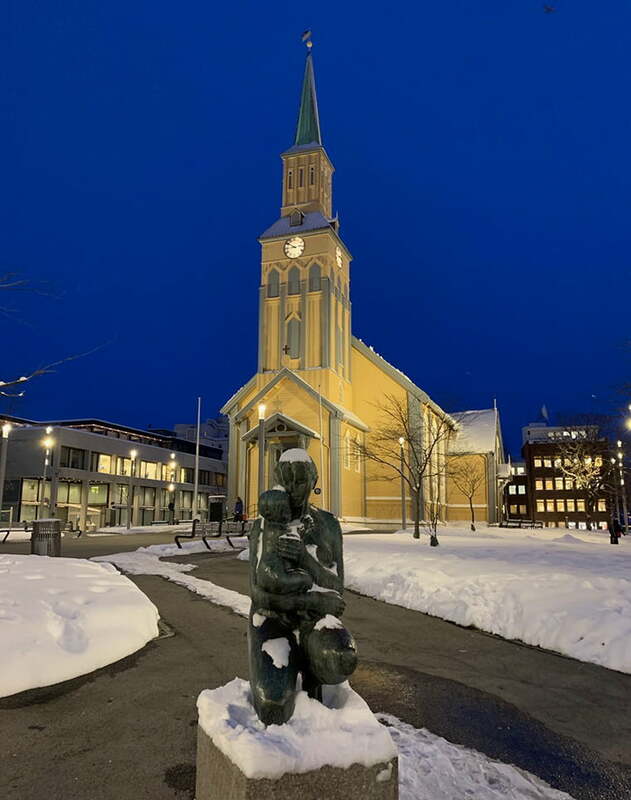 The longest port of call in northern Norway is the four-hour stop in Tromsø, the largest city in northern Norway and a cultural capital of the north. 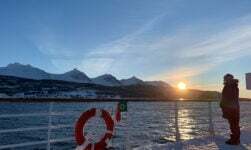 I love Tromsø and have visited many times so this time wandered around with some of my fellow passengers. The main reason was to take some photos of the town during the spectacular blue hour. For reference, these pictures were all taken around 2.30-3pm in mid-January. For the first time, I was able to go inside the cathedral. This isn't the Arctic Cathedral (which is actually a church, and just about visible in the picture above! 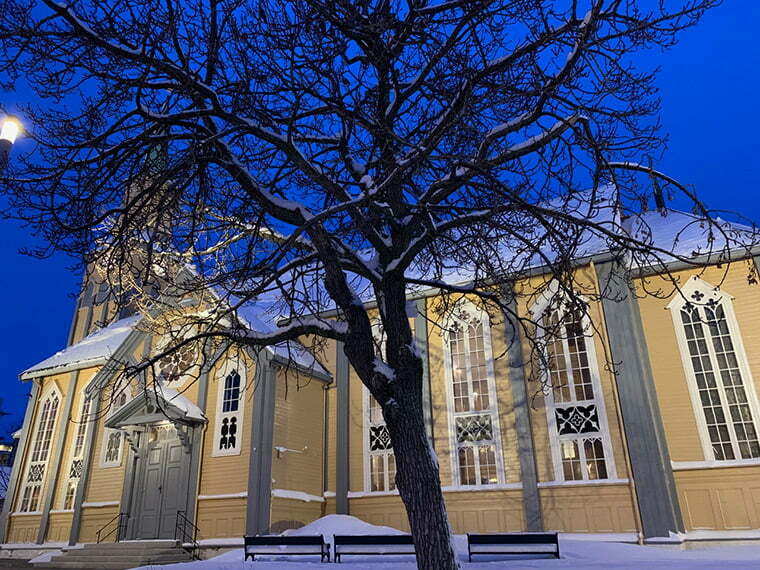 ), rather the wooden cathedral in the very centre of the town. Although a popular tourist attraction, the cathedral still functions with regular services, marriages and so on. Back on the ship I used the time to enjoy a peaceful coffee and chatted with a German passenger. His English was very basic but a lot better than my non-existent German, but we muddled through with hand gestures and me speaking a mixture of English and Norwegian. 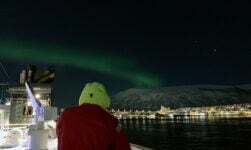 He's taking the full Bergen-Kirkenes-Bergen journey and like me and many others, took advantage of the ‘no single supplement' deal offered by Hurtigruten. There are quite a few solo travellers on the voyage so it appears it was a very popular offer. 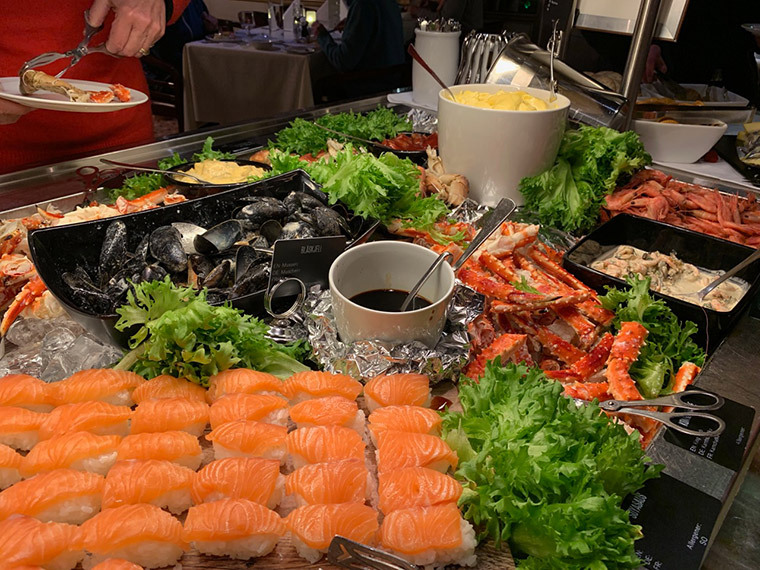 For operational reasons the seafood dinner buffet that is usually served on day 6 was brought forward to today. The choice was impressive: King crab legs, brown crab, king prawns, smoked salmon, mussels, even sushi. It was nice to see that alongside the usual spread of salads, there were other hot options for those who don't like seafood. It was open seating once again which means that so far, I've only sat on my assigned table for dinner twice out of the five dinners so far! Tomorrow we'll be sailing past Norway's northernmost point and I'll be joining the excursion to the North Cape. I've been there before for the midnight sun, and I'm truly fascinated to see what the journey will be like at this time of year. Until then, don't forget to sign up for the book if you're interested in hearing more stories from the trip! 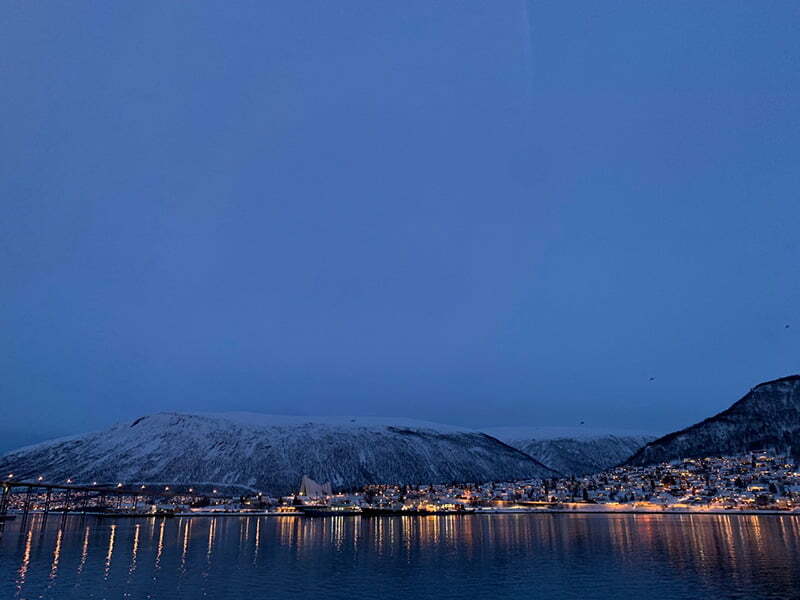 Love Tromso. Discovered it last January and back again in early November. Both trips for whale watching and the Northern lights. Desperately want to take the hurtigruten round trip, hopefully within the next couple of years. Thank you for your daily blog. Really enjoying it. 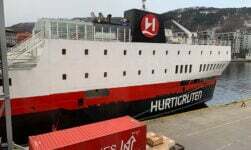 I travelled on Hurrtegruten’s “Lofoten” from Tromso to Hurtigruten in September 2016. We had a storm behind us all the way. I was the greenest passenger in the morning. 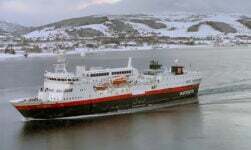 The crew were helpful and even kept the dining room open in Honningsvag as so many passengers hadn’t been up to eating their breakfasts. Standing on the deck at Hammerfest during the night was a highlight. Even the stormy seas were a unique experience. As a solo autumnal aged traveller from Queensland, Australia, it was a wonderful experience. I spent three weeks in Norway: Oslo, Stavanger, Bergen, Flam, Lillehammer, Trondheim, Bodø, Tromso, Honningsvag (bus to Nordkap) and Karasjok. 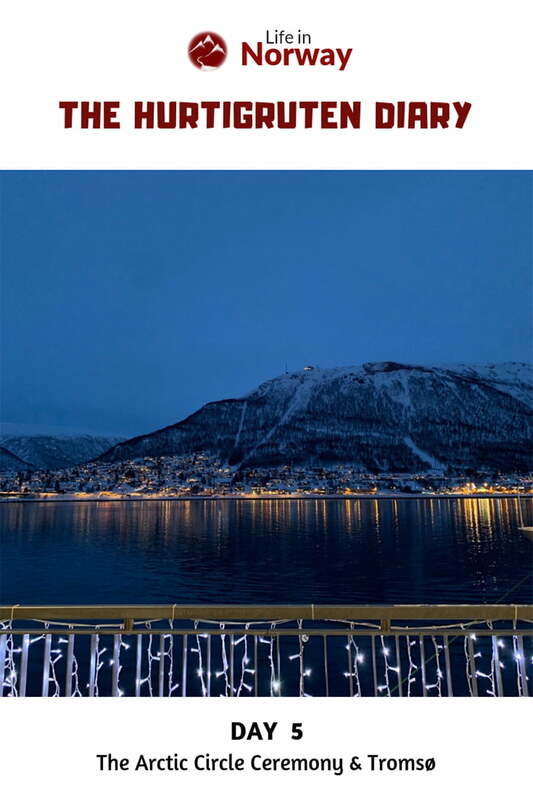 Now I encourage people of all age groups to go to Norway. I give them budget tips to counteract the perception of Norway as an expensive country. I even envy you feeling cold temperatures as I currently swelter in our extended summer heatwave. Enjoy!